Eight Views of the Parlor - In Japan, the scenic "Eight Views of Omi" was a popular subject for woodblock print artists, featuring specific landscapes and weather conditions in Omi Province. Some artists adapted the theme of "Eight Views" using different locations such as Kanazawa or Edo. 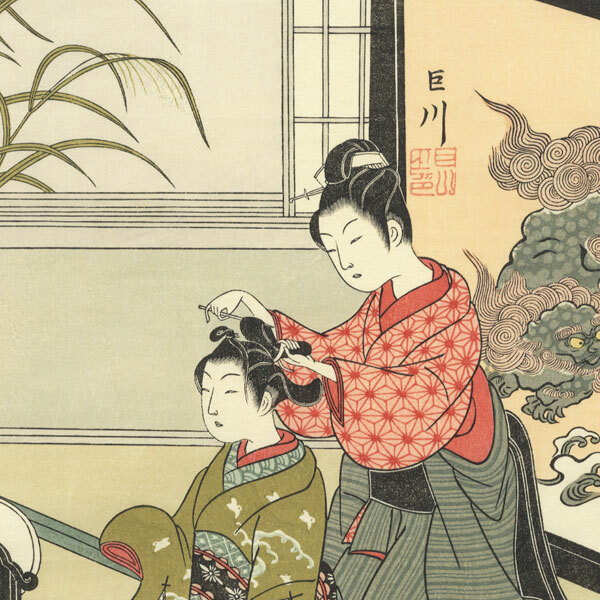 Harunobu went a step further with his witty parody titled "Eight Views of the Parlor," using scenes from everyday life in place of the famous sites. He likens the sound of a boiling teakettle to a night rain, and a towel on a rack blowing in the evening breeze to the billowing of a sail. These attractive designs feature Harunobu's lovely delicate line work and beautifully detailed settings. A great Edo era series by this ukiyo-e master. Adachi Publisher - This beautiful reprint is from the famous Tokyo publisher Adachi, one of the most respected publishers of the 20th century. Adachi woodblocks were printed to the highest standards of quality with excellent color and fine detail. The Adachi woodblock printers were known to be the best in the business. Founded in 1925, Adachi also chose interesting and varied subjects for their prints and was the only publisher of many famous old ukiyo-e images. This print is sealed with the Adachi seal in ink. 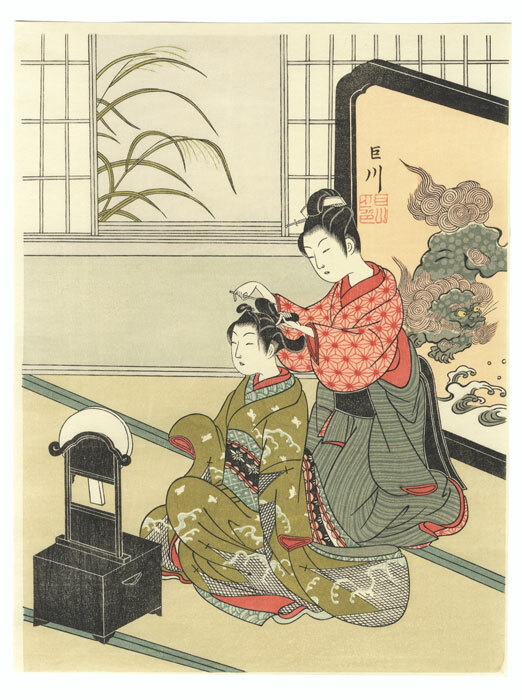 Autumn Moon of the Mirror Stand - Lovely design of a young woman having her hair styled by a maid. She kneels before a mirror stand, her kimono trailing onto the floor around her. Tall grasses frame the open shoji window, and a screen with a lion provides a backdrop. A beautiful Harunobu subject. 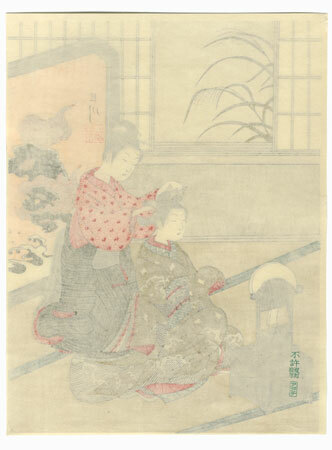 The shape of the mirror on the makeup stand imitates the form of the full moon in this print from a Harunobu series parodying the famous "Eight Views of Omi" using scenes from everyday life.